Everyone who has read CANDY KANE has kept her fingers crossed that the irrepressible Candy would somehow continue her helpful, hopeful, unpredictable ministrations to her difficult family at Fort Benning. And here she is! This time the Kanes are living in a hotel in crowded Washington, awaiting Colonel Kane's orders to leave on what turns out to be a highly secret overseas mission. 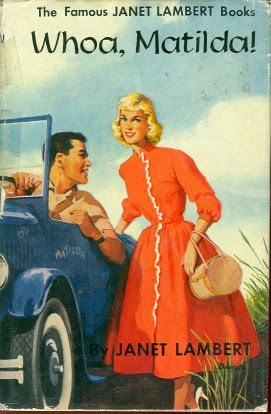 Barton Reed is now a full-fledged private first class, and owns a hysterical old coupe named Matilda. Matilda lacks figure, dignity and self-control, and eventually becomes Candy's most prized possession--because Bart can see no possible way of keeping the delightful old jalopy now that he is in the Army. I mean, jeepers. It's only been two years! Anyway, Whoa, Matilda starts out problematically for me. Remember what I said about the Parrish cook Trudy? And how richly drawn she was as a character? Even though I am willing to give Lambert the benefit of the doubt (and seventy years of history), her introductory words still give me pause. We open in a Washington hotel, where everyone "was working to win the war." "Joe gave a twitch to the very white glove that covered his very black hand and leaned out the door of his elevator. He looked anxiously at the clock in the hotel lobby, and his brow corrugated into chocolate furrows." Joe (married to Kane cook Cleoretta) takes Major Kane, then his wife down in the elevator, and then finally, Miss Candy Kane, who tells him that Barton Reed is in town. The beautiful Leigh is now married to a young army officer named Chris Mathews. Barton chugs into town in his beat-up old car Matilda and meets up with Barton. 'Darn stuff.' He controlled an impulse to smooth back the annoying lock and they remained like two smiling statues, with Barton not knowing quite how to separate their hands or what he should say next." Exciting news? Barton enlisted instead of going to West Point. Much is made of his olive-green "rough woolly blouse" instead of cadet gray. Why? "'But, I'll tell you, Candy, I didn't think I ought to waste so much time just playing football and going to dances when other guys ... Well, I thought I could get into things quicker this way. I don't expect you to understand.'" "'Oh Lawd,' he muttered, shaking his head, 'I jes' cain't stand it if somethin's gone wrong with my Kanes.'" I think the reason that Trudy gets a pass from me and Joe doesn't, is that Trudy is an introduced, well-developed character. Joe exists purely to reflect on the Kanes. Plus, all the "lawdy, lawdy" stuff is so very stereotypical and one-dimensional. He is drawn more fully as the book goes on, thankfully. Marcia (Candy's handful of a mother) is hysterical because Major Kane is going overseas on a top-secret mission, which she does a bad job of keeping secret. Leigh's husband is gone as well, so it's up to the Kane girls to keep house again. Leigh, Candy and loyal Nanna move in with Jane Cameron, now Jane Morton and her baby Cammy. (Marcia decides to live in a nearby hotel instead.) All arrive to news of an invasion in Africa, where it's likely the Kane men have been sent. They had all wondered; after the soldiers' show when Candy had been smothered in compliments, written up in the newspapers, and urged by one of the big motion picture companies to come to Hollywood for a screen test. But Candy had done nothing. She wanted no career, she said. She just liked to sing; it was fun singing." Candy waits for him in the hotel lobby to no avail, then dresses up like a maid and waits for him in his hotel room. He listens to her and works with her on a song, but tells her quite definitively, he will never have a girl singer in his band. She still considers it the best day ever, and heads off to the dance that he's playing at with a boy from her school. Clark Milland finds her at the dance and recruits her to sing to kick off the bond drive. "'I said I'd never use a girl singer in my band. Well, I won't, so don't get any ideas. Lonnie Mayo is sick tonight and the committee for this shindig insists the bond drive must be opened with God Bless America. It's a terrible song but the public likes it. We'll play the Star-Spangled Banner at the end, but no one can just play God Bless America. The song's impossible; but it's got to be sung.'" I love the idea that God Bless America by Irving Berlin is a terrible song. It's a fabulous song and should be our national anthem, not the completely impossible to sing Star-Spangled Banner. Anyhoo, Candy sings, people buy war bonds, and Barton is there in begrudging admiration. The book goes on and the family prepares for Christmas. Marcia and Leigh are determined not to celebrate, but Candy talks them into it. Leigh is even secretly working on a nursery for young mothers whose husbands are off at war; Marcia is wildly involved with the war effort. "It was a new Barton, one she had never seen before. He sat at the table and talked with men; of delaying action and the mobile strength of an armored unit, of radar and a wing command." Candy finishes her tour, and Barton springs the news that he's been recommended for Officers' Candidate School. Meanwhile, the family learns that Dirk has been wounded and is coming home on leave. As the family prepares to leave Dirk and Jane and their baby alone, Candy says good-bye to Barton. 'Okay, we've got that settled.' He kissed her quickly, laid his cheek against hers, then released her." Sigh! Could anything be sweeter? The relationship of Candy and Barton has a beautiful progression, from annoying little pal to more adult love. Plus, I love the softening and maturing of Marcia and Leigh, and the cold, hard truths of war as seen with Jane and Dirk. Lovely.